Does your canine friend have a silky or long coat? If so, I can imagine how much you are spending for her grooming, including her shampoo and coat trimming. Why don’t you save yourself a lot of dollars in the long run by getting dog clippers? Read on and learn how to shop for the best dog clippers for your pet. Obviously, you would want to trim your dog’s coat for aesthetic reasons. Clipping and trimming a dog’s hair can also be beneficial for her health. It minimizes risks of flea infestation. It can also keep her cool during the summer season. Moreover, you’ll be able to save a lot of money as you don’t have to pay for professional services. You don’t even have to go out of the house to give your dog a haircut. Trimming your dog’s coat isn’t as easy as say, preparing homemade dog food. But I am not saying you won’t be able to pull it off. Many dog experts suggest clipping dog hair as early as possible. In fact, I used to trim my Shih Tzu’s coat when she was just a puppy. Hold the clippers in both its “on” and “off” positions, so you’ll know your most comfortable grip. Bathe your dog and make sure she’s completely dry. Eliminate tangles and mats from her coat. Trim her coat in an area where she won’t be distracted. Once you’re ready to trim her coat, bring all your tools within your reach. Make sure that the blade of the clipper is sharp. Use the guide comb so you can achieve a consistent cut. Type. Novice users should get a single speed clipper as it doesn’t heat up too quickly. Advanced users, on the other hand, should get a variable speed clipper which is versatile and powerful for cutting thick dog fur. Motor speed and power. This is usually expressed in RPM or rotation per minute, which simply means the number of times that the motor rotates in a single minute. Noise, heat, and vibration. The most powerful clippers can cut through the coarsest of a coat, but their blades can heat up quickly. Moreover, the noise and vibration may also disturb the dog. Size and weight. Look for a dog clipper that is lightweight and easy to maneuver. Cordless and corded. A cordless clipper can be used anywhere while you need an outlet to operate a corded clipper. Now let’s look at seven highly recommended dog coat shavers today, listed according to their uses. High Capacity Battery: Built-in 2000mAh Li-battery. Lasts up to 7 hours of working on full charge. This beats other ordinary pet grooming clippers by 5x. Long and extended battery life guaranteed. Powerful Motor with non-clogging technology: 3.7V, 15W motor power. Up to 9,000 revolutions per minute, providing amazing power without hassle of unclogging. 33 Teeth Sharp Blade: Compared to other 24 teeth blades, our 33 teeth sharp blade is the best for hairy, thick or soft hair dogs, cats or rabbits. Ultra-quiet Technology: 50-60 db. With noise absorption and silencer technology to reduce the friction between the blades, effectively reducing the noise. Free Gift : A stainless steel sharp scissor & comb are included with every purchase to thank you for shopping with us. If your dog has thick and long coats, this one should be on your short list. It is powered by a 15-watt motor that can make up to 9000 RPM. That’s enough power to cut through the thickest of dog coat. The shaver features a 33-teeth blade. This cordless dog coat shaver is powered by an integrated battery that takes 3 hours to be charged but can last for 7 hours of operation. The noise level is around 50 to 60 decibels which are relatively quiet. You can also use this in trimming the long hair of your feline pet. 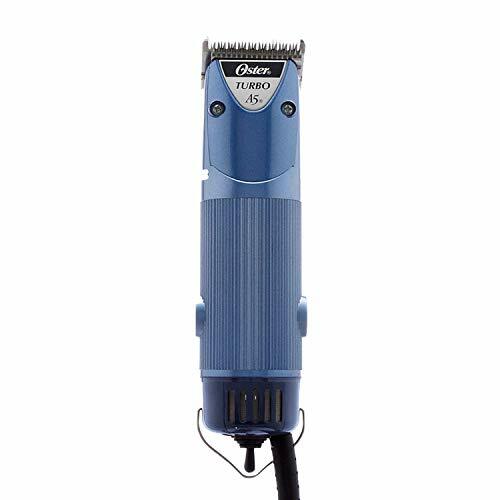 [2-SPEED HEAVY DUTY Professional Pet Clippers, BEST PRICE PRO CLIPPER EVER] -5500/6500 rotation per minute. So far, such TURBO professional pet clippers are all above $100. The 2 speed grooming clippers are designed for different-need groomer, especially for the professional groomers. Welcome to compare our product with other brand clippers such Oster, Whal, You cannot find such pro standard clipper at such price from other sellers on Amazon. 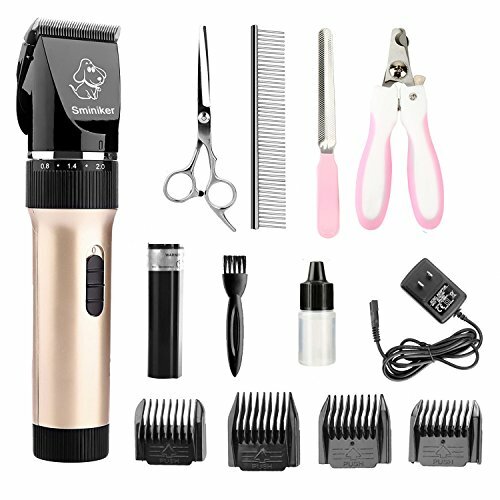 [Extremely Long Using Time of 300 Mins with Fast 3 Hours Full Charge] The professional pet clipper has a built-in rechargeable 2200mA Li-lion battery inside. The pet clipper can be used continuously for 5 hours with a full charging time of just 3 hours. Such long time power supply is especially perfect for the professional groomer. No matter how thick the hair is, you can do the grooming work with no interruption. [Superior Quiet Motor- Pet Friendly] This professional pet grooming clipper features in its low noise. The sound it produces when working is less than 60 decibels. It has such low noise is because the premium motor it used. Just compare our products to others, you and your dogs will definitely like it! [User-friendly Cordless & Cord use] The professional dog clippers come with a charger. And the rechargeable Li-ion battery makes it cordless available. If you are a professional groomer who need use the clipper for a long time, you can both use with cord or cordless. The design gives users more choice. No matter you like the cord use or not, you can get pleasure when you use it. [Adjustable Ceramic and Stainless Steel Blade] This professional clipper has one blade that could be adjusted to 1.3mm/1.6mm/1.9mm. With this design you can easily decide the length of hair you are going to leave without the aid of comb. The ceramic and stainless blade is one of the most unique feature of our clipper to reduce the heat producing in the grooming process and ensure sharper effect. This unit can also be relied upon in trimming thick dog coat. As you can deduce from the name, it has a two-speed setting. You can choose between 5500 and 6500 RPM. The battery of this unit takes about three hours of full charge but can work for up to 5 hours. The noise level is around 50 to 60 decibels, which makes it relatively quiet. You’ll also love that the clipper has an ergonomic handle. Plus it is lightweight and easy to store. This product features a ceramic movable blade paired with a titanium blade for quick and efficient cutting of dog nails. Its low vibration motor operates at a noise level of around 60 decibels, which some people find a bit too loud for their pets. It also comes with a rechargeable battery, which would take 4 to 5 hours to be completely charged. Usage time varies but averages around 60 minutes. This is also well-designed with a handle that you should find very comfortable to hold. 【Cordless and Quiet Silent Dog Cat Grooming Clippers】: Sustain uses of 70 minutes after fully charge.1 Extra Backup Battery offered for backup at any time.Besides, two working mode: Cordless and working with charger, which provide much convenience. 【High quality Titanium Sharp 33 Blade】: High quality Titanium blade and moving blade can provide excellent cutting performance, and Not get hot with long time use. Detachable blades for ease of changing and cleaning : set the collar setting to 2.0mm,then hold the blade, push it down. 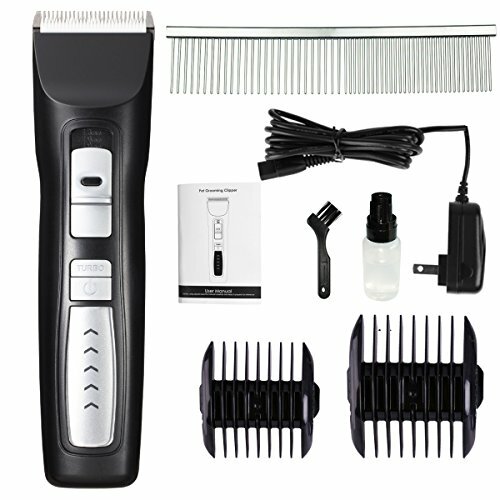 【Low Vibration, Low Noise and Light Weight】: Precision motor with special denoise technology, reduce noise to below 60db (equal to ambient noise),which helps pets feel at ease and not afraid of hair cutting any more. 【New User Friendly Design 4 Guide Combs】: 3-6-9-12mm adjusting and detached combs were provided for different lengths of pet hair, tune cutting and trimming depth.And user manual make the pet grooming safe, easy and comfortable even if you've never done it before. 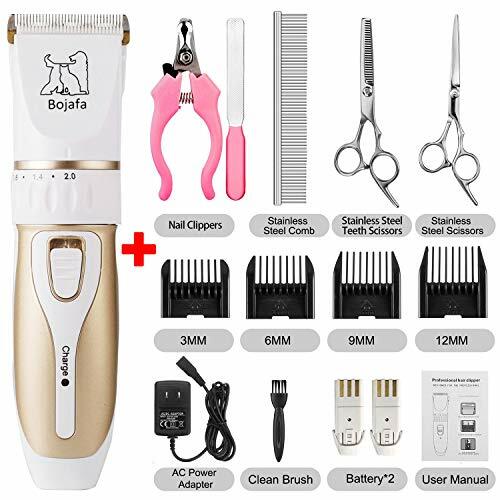 【ALL-IN -ONE Value Dog Grooming Tools】: 1 x Pet clippers (one battery inside),1 x AC Power adapter,1 x Extra battery,1 x Stainless steel comb,2 x Stainless steel scissors,1 x Dog Nail Clipper Kit ,1 x Nail File,4 x Comb Attachments (3-6-9-12mm),1 x User manual,1 x Cleaning Brush.Besides, please clean and maintain the dog clippers according to User Manual. This cordless clipper can work in two ways--- cordless working or working with charging. It will take about five hours to fully charge it. Operation time is about 70 minutes. The manufacturer also throws in an extra backup battery. This is also quiet when cutting through dog coat with a noise level of about 50 decibels. The vibration is also minimal which means your dog won’t be bothered by it. There are four guide combs included in the package. The blade is made of titanium and ceramic. This 16-piece grooming kit has everything you need to groom your dog. Aside from the nail clipper, the manufacturer adds a bonus instructional DVD, grooming apron, a pair of scissors, a comb and a 9-inch storage case to the kit. The centerpiece of this set is the U-Clipper, which you can use for trimming fine to medium dogs coats. You can use this for small and medium sized dogs. It is powered by a powerful yet quiet motor that can churn out 7200 strokes a minute. This electric nail clipper has an eight feet long cord, so you can groom your pet without having to be near a wall outlet. Apart from that convenient feature, the clipper features a comfortable and ergonomically designed grip. 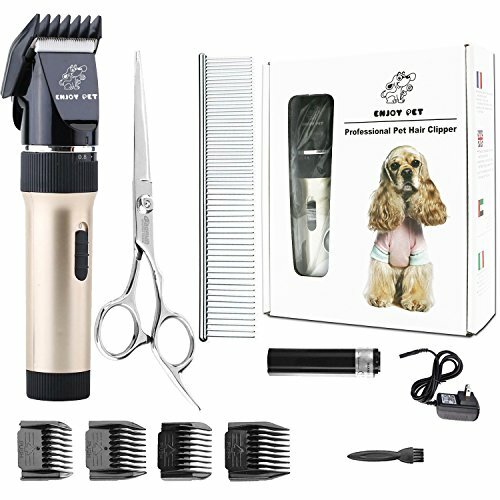 If you’re looking for an efficient, reliable and easy way of grooming your dog, then this animal clipper is one for you. It is powered by a powerful motor that doesn’t bog down like most plastic clippers. It has two-speed settings. It can make up to 4,000 strokes a minute, giving it enough power to tackle any nail regardless of its thickness. It is easy to operate, too. Simply flick the switch to change from low speed to high speed. This is a portable dog nail clipper weighing 11 ounces and measuring 3 inches long, 10.5 inches wide and 6 inches tall. With its size, you can easily place this in the drawer or your bag if you are traveling with your dog. The unit comes with a brush and instructional manual. This is another user-friendly dog clippers that you might want to get. I like how it was designed—it has an R-shaped edge that prevents accidental cutting of the pet’s skin. It also has a ceramic blade that is movable and strong enough for long-term cutting. It won’t get rusty, too, so you can be assured that the clippers would stay useful for quite a while. The motor is also very quiet while in operation. The sound level is limited to about 50 decibels which are quiet enough for most dogs not to be bothered while their owners are grooming them. While the unit itself needs about four hours of charging, it can be used for five to six hours. Before I end, let me give you my recommendations for dogs with short, medium and long hair. 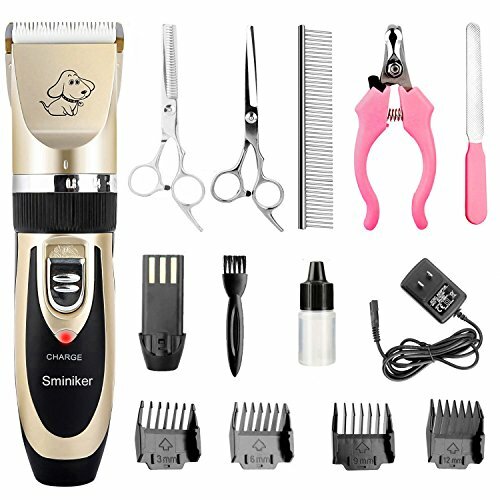 The Sminiker Rechargeable dog clipper is the best choice for dogs with short hair. It is comfortable to hold and powered by a low vibration motor. The titanium blade can do an excellent job of cutting dog hair. For thick and long coats, I would recommend the Enjoy Pet clippers. It has a powerful motor with a 33-teeth blade. Its battery can last long, and it works quietly. 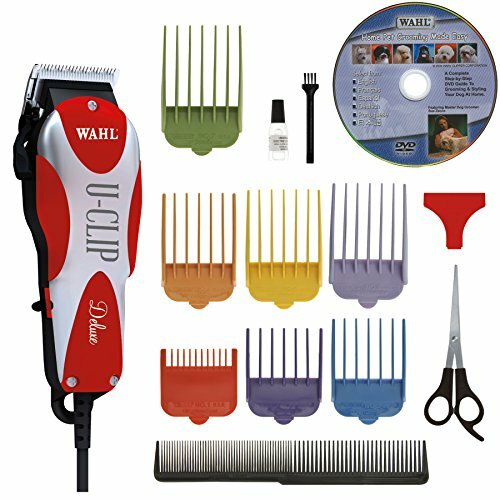 And the Wahl clipper is my choice for grooming dogs with medium coats. It is easy to operate with a powerful and quiet motor that can easily cut through dog hair.